What do you have in mind? 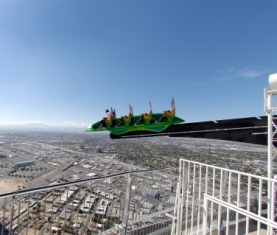 Las Vegas Attractions can vary from Roller Coasters to sightseeing historical buildings. There is so much going on in the "City of Lights" at any given time of the day or night, don't plan on being able to do it all. If you would rather do something fun other than gambling. Our goal is to give you some ideas that you may have never dreamed exist here. Get a Great Deal on fun with the LV Power Pass. Aquarium at the Silverton - FREE 1-866-946-4373. Mermaids swim inside and blow kisses to your children. Shark Reef At Mandalay Bay - 702-632-4555. Great Rides and More for Kids - This page is our complete resource for hundreds of things that you can do with your kids in Las Vegas. Visit here for kid friendly shows, activities, theme parks, horse back riding, fitness and so much more. M and M World - On the Las Vegas Strip, everything M and M, gifts fun, take souvenir pictures with the big M and M characters. This is something fun to do with the kids, but plan on purchasing some very expensive candy. Circus Carnival Midway and Circus - Acrobatics, circus acts, carnival games and shows inside Circus Circus, win prizes, see FREE shows. These are usually going on all day throughout the day. For some extra money you can participate in the carnival midway games which are typical of a carnival, bean bag toss, water horse race, shoot hoops for big stuffed animals, you name it! Mirage Volcano - Eruptions are FREE on the Las Vegas Strip. This has no educational value whatsoever, but it is pretty cool to watch. It starts as a quiet waterfall and then turns into lights and action with the noise and fire and then the water eruption. It also can give off a little heat if you are chilly. Bodies or Titanic Exhibitions. These are pretty amazing, the bodies exhibit is nothing you will ever see again, so don't miss it. Only people in medical school get to see this type of display. They are real bodies that are dissected to show you muscle and bone and inner working parts. There are even fetuses so this is not for the faint at heart. The titanic is very much history and it is really nice to see the old items that they have salvaged from the sea. It is also sad as well, but very entertaining. Madame Tussaud's museum Sing for Simon Cowell, turn blue, marry George Clooney, the fantasy is real at this wax museum. I never really did see the awe in this type of display, but for those that are into this, it is really amazingly talented art. The Fremont Street Experience October Fright Fest, live bands, great dining! Plus a spectacular light show. Downtown is really becoming a cool hangout. They have redone a lot of the casinos and bars thanks to the motivation of our resident Zappos that started a downtown renovation revolution. Take some time to check out the "new" "old strip." In days past we used to be able to cruise this strip in our cars where the Fremont Street Experience is now. If you have not found what you are looking for yet, you should visit the Las Vegas official tourism site for more ideas and links to great Las Vegas Attractions. Practically every hotel and casino has something extra to entertain you! Return to Las Vegas Things to Do From "Las Vegas Attractions"